completed in 1915. Notice Board at First Dromore Presbyterian Church. It appears that the earliest minister of Dromore was Mr. Henry Hunter, a Scotsman (lic. Down), who was ordained circa May 1660, suspended in 1661 and died in 1674. Rev. William Leggat next settled here. He was licensed by the Presbytery of Down in 1670, and having been ordained in Drum in 1671 he was called to Dromore O.C. and installed in 1675 to the charge of that congregation. At the Revolution he retired for some time to Scotland; but in 1691 he returned here. He was Moderator of the Synod of Ulster in 1693, but absent from it in 1694. The congregation was vacant in 1697, but whether in consequence of the death of Mr. Leggat or his removal to Scotland, is not known. The next minister was Mr. Alexander Colville (lic. Cupar) who was ordained in Newtownards on 26th July 1696 and installed here in 1700. He died on 1st December 1719. In 1724 the majority of the congregation by their commissioners, Messrs. Robert Hamilton and Thomas Ingram, supplicated the Synod to be annexed to the Presbytery of Down; and a minority by their commissioner, Mr. John Magill, supplicated to be continued with the Presbytery of Armagh. The Synod annexed them to Down. The subscription controversy had now commenced and this congregation felt the effects of it. In 1724 Mr. Alexander Colville (or Colvil), son of the preceding minister, being refused ordination by the Presbytery because he refused to subscribe to the Westminster Confession of Faith, repaired to London, and was ordained there in Dr. Calamy’s vestry in December 1724. On 25th October 1725 he was irregularly installed in Dromore by the Synod of Munster. For this he was suspended by the Synod of Ulster, and many of the people withdrew from his ministry and formed another congregation in Dromore. Mr. Colvil Jun. became an M.D.(Edin.) in 1728 and joined the Presbytery of Antrim in 1730. He died on 23rd April 1777. The first minister of the congregation so formed was Mr. James Allen (lic. Armagh) who was ordained here by the Presbytery of Armagh on 18 May 1726. He appears to have demitted this charge about 1752. He was succeeded by Mr. William Henry (lic. Dromore) who was ordained here on 1stMay 1753. Mr. Allen died on 14th January 1764. Mr. Henry, who was grandfather of Dr. P. S. Henry, President of Queen's College, Belfast, resigned this charge and removed to Comber, Co. Down, in 1776. He was succeeded by Mr. John Cochrane (lic. Ballymena) who was ordained here by the Presbytery of Dromore on 5th May 1777. He died on 8th September 1779. He was followed by Mr. James Waddle, (or Waddell), a Dromore licentiate who was ordained on 3rd August 1784. He died in this charge on 12th July 1815 and was succeeded by Mr. James Collins (lic. Tyrone) whose ordination took place on 17th September 1816. After over forty years Mr. Collins obtained an assistant and successor. He was Mr. Jackson Smyth (lic. Route) who was ordained on 20 Jan. 1857. Some time later Mr. Smyth (he received a D.D. afterwards) was called to First Armagh and on 27th March 1860 Mr. James Kirker Strain (lic. Belfast) was ordained in Dromore. Mr. Collins died on 19th December 1863. The Rev. J. K. Strain was awarded an LL.D. from the Royal University of Ireland in 1885 and after forty active years he died on 28th December 1907. An Ahoghill licentiate, Mr. John Carson Greer, was then settled but only for three years. He then accepted a call to Strand Church, Londonderry, on 1st October 1912. His successor, Mr. Thomas Doey (lic. Tyrone) was ordained on 13th February 1913 and under his guidance the present fine meeting house was built in 1915. He was called to Coleraine, New Row congregation on 2nd September 1918. The thirteenth minister of First Dromore was Rev. Andrew Thompson, formerly of Tobermore, and he was installed on 6th March 1919. He retired on 30th Nov. 1951 and died on 7th March 1968. During his ministry a new organ was installed. The Rev. Frederick Leslie McConnell of Albert Street Church, Belfast, was then installed on 17th April 1952. He had extensive renovations carried out, a new church hall built and a fine car park provided. Mr. McConnell retired on 31st March 1976 and was succeeded by the Rev. William Donald Patton (lic. Armagh) who had been ordained assistant (5th January 1975) in Trinity congregation, Bangor. He was installed here on 16th February 1977. In August of 1983, Mr. Patton received a call to Greystone Road in Antrim. His successor, the Rev. Roger Crooks was installed in September 1984 and in 1997 he accepted a call to Belvoir congregation. A lengthy vacancy followed during which the Rev. Dr. Roy Magee was appointed stated supply. The present minister, the Rev. Keith Duddy, was Ordained in Mersey Street Presbyterian Church in 1987 and installed in Clarkesbridge and the Groves in 1989. From 1998 to 1999 he was a Missionay in Nigeria with the Qua Iboe Fellowship. 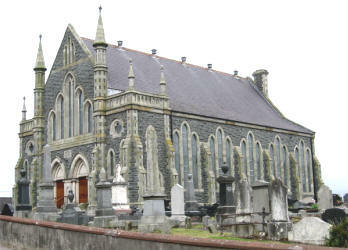 Mr. Duddy was installed in First Dromore Presbyterian Church in March 2000. During his ministry a new manse was officially opened by the Moderator of Presbytery on Saturday 23rd November 2002. The following brief history was compiled for an article in the Dromore Leader. In 1660 a Presbyterian congregation was established and the Rev Henry Hunter was ordained in May of that year. Mr Hunter’s ministry was shortly to be disrupted as within a year he was deprived of the parish church and tithes by Bishop Jeremy Taylor. For most of the next decade Hunter and his congregation, like most Presbyterians, had no regular Meeting House and met for worship in either private homes or in barns. In about 1670 the congregation built its first Meeting House on the Diamond Road, probably on or about the site of the present church. Alexander Colville, who was installed in July 1700, died in his pulpit on 1stDecember 1719 while conducting public worship. At that time the minister’s son, also Alexander Colville was a student at Edinburgh University, with a view to taking up a career in medicine. The congregation wished to have him as their minister and persuaded him to take up the study of theology. Difficulties arose when a formal call was presented to Colville in 1724 because in the interval he had decided that he did not wish to subscribe to the Westminster Confession of Faith. Contrary to Presbyterian discipline, Colville went to London in December 1724 and was ordained by a group of ministers in the vestry of Dr. Calamy’s Meeting House, without subscription. On returning to Dromore he took up duties as minister of the congregation and applied to the Presbytery of Armagh for Installation. This was refused and at the following meeting of the General Synod Colville was censured and suspended for disorderly conduct. Once more he took matters into his own hands and requested that he and his congregation might be received into the Southern Association, which was known to hold Non-Subscribing views, and which was outside the jurisdiction of the Synod of Ulster. This was granted and Colville was formally installed in Dromore, by a commission of the Southern Association on 27th October 1725. There then followed a split in the congregation. Colville’s Call was signed by 400 persons, which implied upwards of 400 families or two thirds of the congregation. The remaining one third, or 200 families withdrew from his ministry and were established as a separate congregation. The Rev James Allen, first minister of the congregation so formed, was ordained here by the Presbytery of Armagh on 18th May 1726. At first the new congregation held services in an old kiln at the head of Rampart Street, however within a short time Colville and his congregation built a new Meeting House in Pound Street and vacated the old place of worship on the Diamond Road, which was now re-occupied by the new congregation. During the years 1815 to 1837 the church was enlarged and a manse was constructed in about 1878. 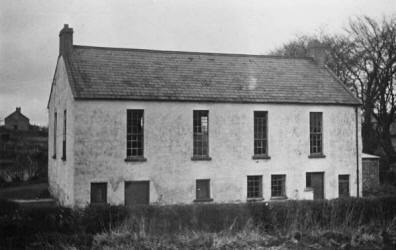 A record at the Ulster Folk Museum, dated 1837, describes the building as a whitewashed, rough-cast edifice with accommodation for 1,200 and an average attendance of 700. In 1914 the old church building was demolished and the present church, with a seating capacity of 800, was completed in 1915. The old school house (erected in 1860) was demolished in about 1959 and a new church hall built on the same site, was opened in 1960 and extended in 1979. The present minister, the Rev Keith Duddy, was installed in March 2000 and during his ministry a new manse was opened in November 2002. The above brief history is largely compiled from an article written by the Rev Dr. J. W. Nelson. The Old School at First Dromore Presbyterian Church, erected in 1860. It was demolished in the late 1950’s and a Church Hall built on the same site was opened in 1960. The Rev. 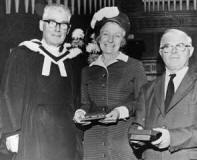 F. L. McConnell pictured with Miss Sadie Stronge - Sunday School Teacher at First Dromore for 45 years and John McGrehan - Sunday School Teacher (1934 -1954 and Superintendent (1954 - 1984).